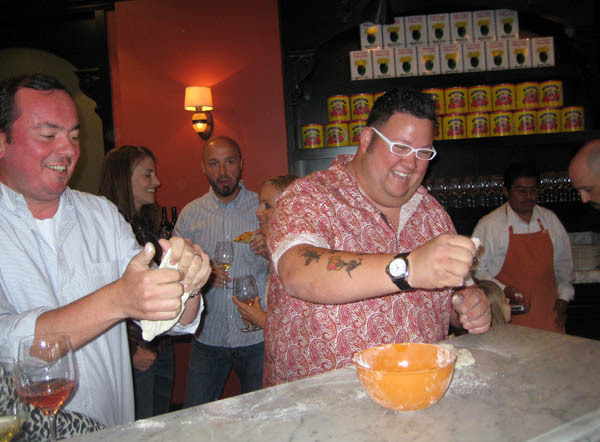 I first met Graham Elliot through my work with MasterChef, he is a judge on the hit Fox television show, along side Gordon Ramsay and Joe Bastianich. Towards the end of the filming of season 1, Joe and I organized a pizza party at Mozza Scuola di Pizza and in this informal atmosphere I got to know Elliot a little more. What I’m enjoying about Season 2 is the humor and fun that was not always there in the first season – Ramsay, Bastianich and Elliot are now much more comfortable with each other and their roles on the show and able to joke on camera – more please! 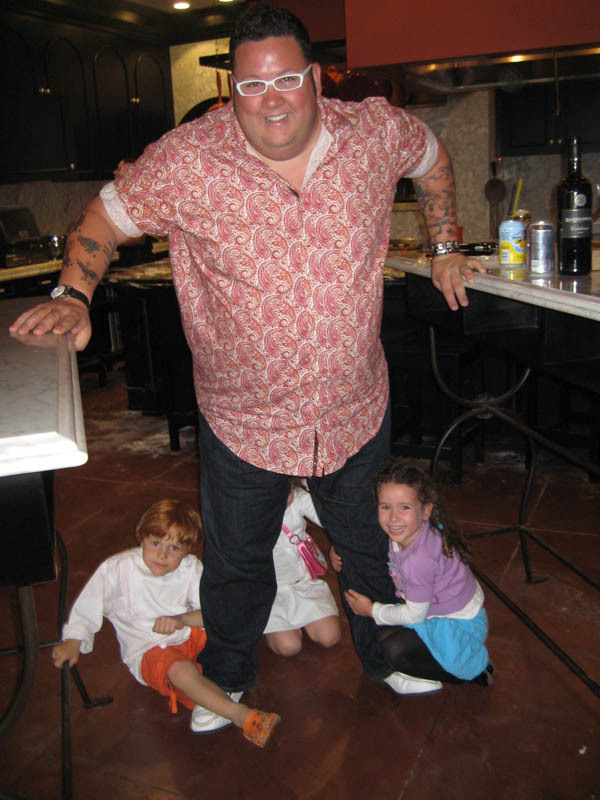 He’s like a giant teddy bear – and was a huge hit with the kids at the party. He very patiently played hide and seek with them and then didn’t mind as they climbed his legs and generally thought of him as one of them – only bigger and more fun! For season 2 I was sent around the country as a Food Judge for MasterChef, helping to find the contestants for the show as I tasted their food to make sure that they weren’t just a pretty face or a large personality but that they could cook. It’s a cooking show after all. At the Chicago casting call Elliot showed up to jolly things along during frigid temperatures with scores of hopeful people lined up outside in the snow. After a long day of casting he joined us that night – ordering duck fat fries and fish and chips – for the hungry casting crew and a birthday. I had invited Matthias Merges to be a Food Judge with me for the casting call – it always helps to have a local chef to help pick out the good from the not so great. 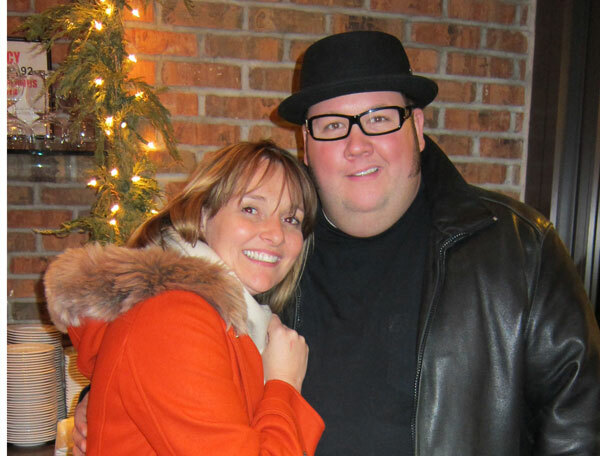 Merges was the Executive Chef and Director of Operations at Charlie Trotter’s for 13 years. Elliot had worked under Merges’ watchful eye in the kitchen during the 3 years they spent working in this famed restaurant together. They were so happy to catch up and hang out. Elliot talked about the times Merges had calmly talked him back into the kitchen and how much admiration and respect he has for Merges as a chef and a man. So much so that he gave his son ‘Matthais’ as a middle name. Merges called him “Elliot,” his name from the kitchen. They are old friends – bonds formed in the kitchen are strong, it’s as if these two had lived through a war of sorts together working the line and watching out for each other. For Made in America Elliot gave me a his recipe for deconstructed Caesar Salad with “Twinkies” – it’s such a great recipe full of the whimsy that Elliot infuses into his cooking. This was the second recipe that Elliot had given me – initially he was going to do an American take on risotto, but I needed a caesar salad recipe and his was a perfect match – different, delicious and yet from an America classic. 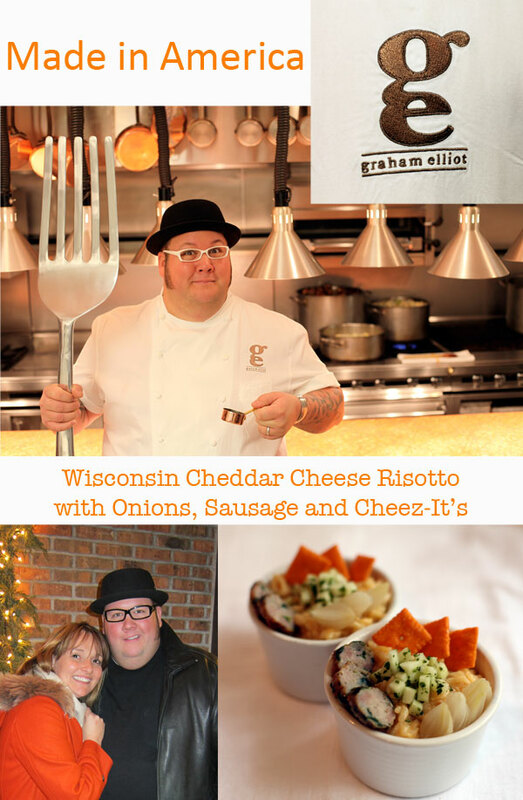 “I have to tackle this recipe—it’s so close to what I do with Wisconsin Cheddar and rice. 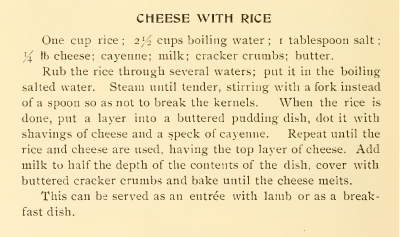 On Top Chef Masters I did a version of this with Cheez-Its®.” So here you have in all its rich creamy cheesy deliciousness, an entirely modern Elliot “bistronomic” version of Mrs Lincoln’s Cheese with Rice. 1. In a heavy-gauged pot over medium heat sauté the onions with olive oil until translucent. Increase the heat to medium–high, add the rice, lightly season with salt and toast, stirring constantly, until it becomes aromatic and the rice is translucent, 2 to 3 minutes. 2. Add the wine and stir until fully absorbed and the rice starts to appear creamy. Add a third of the heated stock to the rice and continue stirring as this is absorbed. 3. Add the rest of the stock one ladleful at a time, allowing it to be absorbed before adding more and stirring constantly, about 20 minutes. When all stock is absorbed and the rice is al dente—soft but toothsome—it is ready. 4. Fold in the cheddar cheese and stir until the cheese is melted and fully incorporated. 5. Remove the risotto from the heat and finish with the mascarpone, salt and freshly cracked black pepper. Let sit for 2 minutes. 1. In sauté pan heat the olive oil and lightly brown the onions on medium- high heat for about 3 to 4 minutes. 2. Add the thyme and bay leaf to the pan and season with a dash of salt. Cover with the wine and stock. Simmer on low until the onions are fork tender. Toss the apples with the lemon juice, chives and olive oil. Season with fresh pepper and salt. 1. Roast the sausages under a broiler for eight minutes until warmed through and the skin begins to blister. 2. Slice the sausages on the bias into thin medallions. 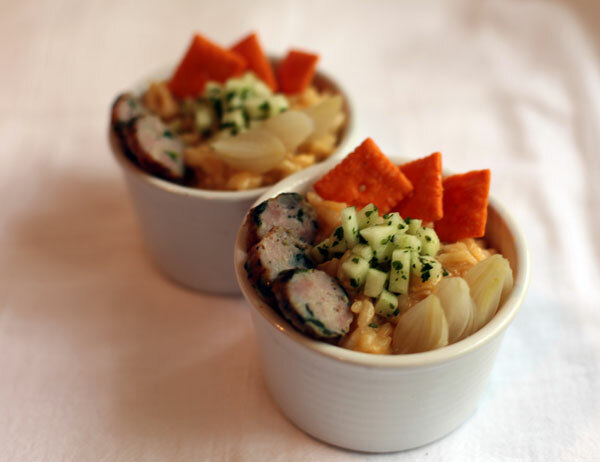 Place the risotto in individual small bowls. Arrange a few slices of sausage, some onions and Cheez-Its® on the rice. Garnish with the apple salad and serve immediately. I am SOLD on the cheez-its in that risotto.